Blood Link is a suspenseful and pretty scary thriller. Craig Manning (Moriarty) is a doctor. But for some nights now he's been having horrific visions of murders. It turns out he has a siamese brother (also played by Moriarty) who lives in Hamburg. Craig tracks him down to unravel the mystery. Blood Link is worth watching for the usual excellent performance by Moriarty. He puts a lot of energy and character into the role. The direction by De Martino is fast-paced and the music by Ennio Morricone is always worth a listen. 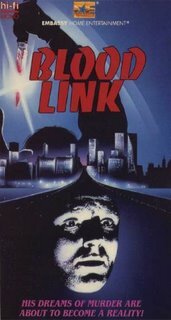 In the end: If you can find it, Blood Link is an interesting horror movie worth watching. Moriarty is the man, and your site is contributing to my ever-growing list of movies I need to see. Thanks! Seriously. I mean that. Thanks. That's very kind of you to say that! Your site is excellent also.